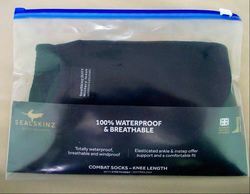 Here we have a pair of current issue waterproof, windproof and breathable socks, made by the Sealskinz brand. These are ideal if your boots leak, as the water never reaches your foot, so it feels like a new pair of boots, but without the expense! Extremely comfortable when worn with combat boots, durable and hard wearing. Elasticated ankle and instep offer support and a comfortable fit. Brand new condition, never been worn.